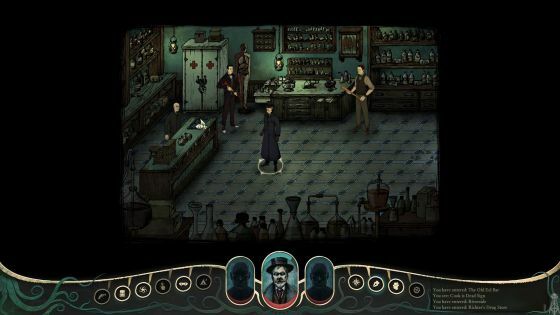 Stygian: Reign of the Old Ones takes place in an alternative history in the 1920's of New England. 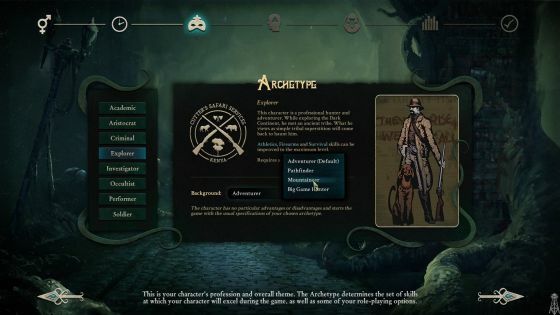 In the game you get to create your character from 8 different archetypes from that era, like an aristocrat, occultist or investigator. All modelled afteler Lovecraftian archetypes. 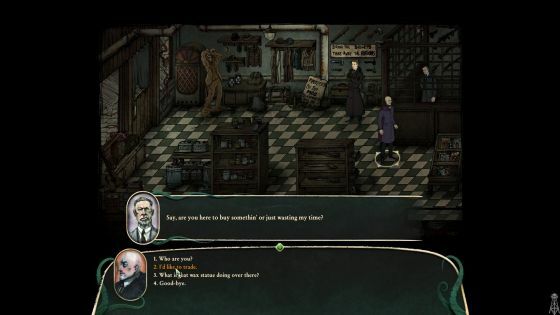 The game takes place in the fictional town of Arkham after the awakening of the great Old Ones. You meet a character called the Dismal Man. He tells you to find him beyond Arkham after the Black Day. The main story is about following his footsteps in order to find some answers. You have a choice on how to approach that, like follow him for vengeance as you feel he is responsible for what happened to the world. Or maybe you end up joining him. The choices you make in the game will have an impact on the story and also the endings, of which there are eight. As mentioned, the ending you get is determined by the choices you make, such as who you are, who you are adding to your party, your relationship with them, your actions in the world and the pacts that you make with others in the game. Also people can react differently based on who you are and what choices you have made. If you are a criminal and you interact with another criminal you can have a different conversation than if you would be a soldier. The game starts with the creation of a character and the first thing that needs to be done is the selection of one of eight archetypes. Each archetype has a number of backgrounds, which allows the player to further specialize the character being created. Every selected specialization comes with a bonus for a specific skill, but also with a disadvantage for another skill. Selecting the default archetype, will give no advantages nor disadvantages. Next to your gender, you also have to set the age and name of your character. A younger character is more physical and healthier, but starts the game with less skill points and for an older person it is the opposite. For an adult person that is neither young nor old, you get by default 7 attribute points and 5 skill points to spent on your character. The system will also show which skills are recommended for the selected archetype, but it is only a recommendation. Also a belief needs to be selected. With this belief system you can choose whether you are going to be a rational person, nihilist, a humanistic one or someone else. They have implemented this because it gives them more flexibility than having good and evil choices. Whenever you act according to your belief system you gain sanity, like an altruist who helps other people. However acting against your belief system will make you lose sanity. And a lack of sanity will again have an impact on your actions. The game has two ways of leveling up. You get one merit point when you have gathered sufficient experience that can be spent on a skill (perk or a combat ability). Each archetype comes with 3 predefined skills. These skills can be leveled up to level 10, but you can choose to select any of the other available skills as well, but they cannot be levelled up further beyond level 7. The other way is related to the Angst system, which indicates the pain you have suffered throughout the game. Whenever you level up in the Angst level you need to select a defect, which are always negative to the player, like insomnia or kleptomania. These will alter small elements of the game system and create certain disadvantages. Bloodthirsty, for example, will make you crave for combat. The result is that if you do not start a fight within a certain amount of time, there will be complications. However if you are a combative player choosing this defect will probably not really have much an impact on you as you will try to end up in combat anyway. So to some degree you can strategically select the defects that have the least impact on your character. The game only has auto-saves. They did not want the player to save at any location as they feel it makes the choices you have to make in the game and the resulting consequences less impactful. Because of that they have made a five slot auto-save system. However the game also saves when you quit, so you can use that time consuming method, to save anywhere you want. 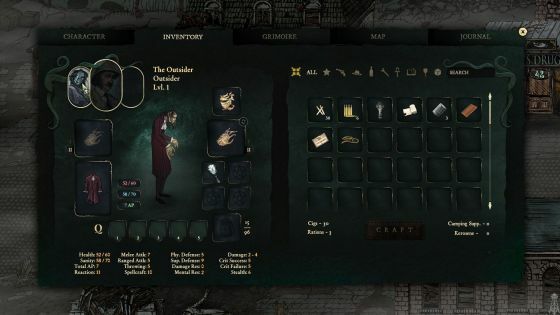 The game supports a crafting system to craft items based on recipes, blueprints and formulas and for which you need the stuff that you can find or get in the game. However the demo did not have that feature, so it could not be shown. You can also buy and sell items with certain NPCs, using the currency in the game, which are cigarettes, or Cigs. The game gives you an isometric view, centralized on your character and you cannot rotate the camera. You move around in the game by going left, right, up or down. The area you go through is not small, but not too big either. You can move to a new area at the end of one of the edges when it shows some footsteps on the streets. These are only shown when you can move to that new area. Entering a building will load a new map that you can move around in. The overall map shows the various places you can go to, but there is no support for auto-travel. On your travels you get the option to have others join your party, of which you can have two. Instead of that you can also hire one or two mercenaries to join you. There are also factions in the game, but you cannot really join them. You can come to an agreement with some of the factions, which will help you with them, but not necessarily with others. Combat is turn-based and uses action points. Moving to a next hex is an action point and attacking will cost five. 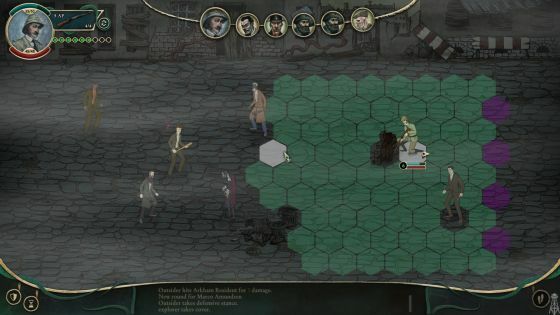 The combat uses a hex-grid. The color of the grid shows the optimal range of the weapon, from green to yellow and red, resulting in the chance to miss increasing and the damage inflicted decreasing. Using a rifle will make the tiles close to you red, as it is more difficult to hit someone at point blank range with a rifle. Purple colored spots are areas you can go to in order to flee combat if things get too tough, so you can find some companions or hire henchmen to deal with your opponents in a better way. And finally once we have damaged the enemy sufficiently some blue spots will show up, which are progression exit points. Using those will allow you to skip the rest of the combat. It is different from fleeing as it allows you to continue as if you succeeded in combat and you still get the same experience as when you finished the combat in the regular way. In that way they want to allow you to be able to focus more on the story and what is happening around you. Doing side and rear damage will do more harm than a frontal attack would, so at the end of a turn you have to make sure you are positioned correctly. While in combat you get an indication of the health of your opponents by means of a number of scratches that each of them show next to their head. One scratch means they are lightly damaged, two scratches indicates they are moderately damaged and with 3 scratches they are seriously damaged. My fight was with a bunch of lunatics who behaved very chaotically, resulting in them even attacking each other every now and then, but as they are lunatics they have skills that might also result in loosing sanity and increasing the Angst of the character I played. They were not too difficult to beat though, so I didn't have to flee from the fight. The graphics of the game don't really do it for me. It could just be me though. Whatever it is, it didn't distract me too much as there is a system underneath the game that could very well convince me to play the game and enjoy it tremendously. I was not able to play enough of the game to verify, but there is a demo on Steam, which I haven't played yet, that might show more of the potential interesting parts of this game. 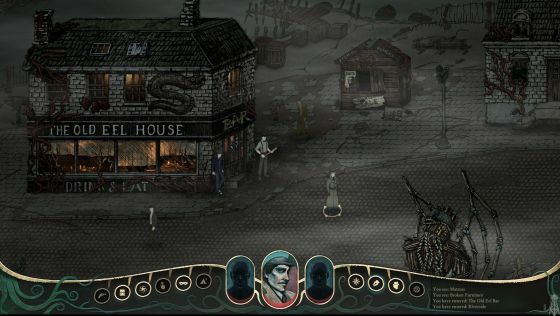 Stygian: Reign of the Old Ones is scheduled to be released in 2019.